Pro baseball is governed by the Official Rules of Baseball -- a set of rules set out by the Office of the Commissioner of Baseball. 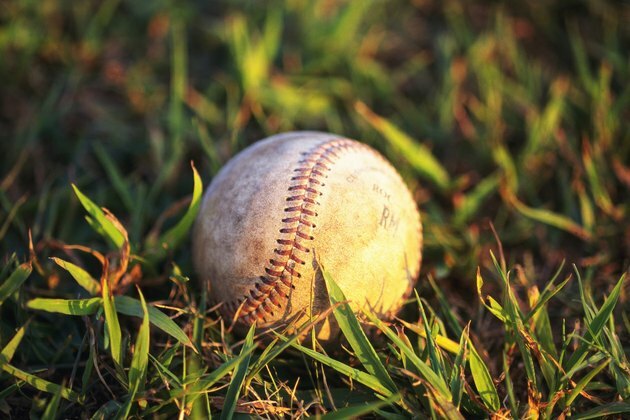 Although amateur leagues can modify the rules, they commonly follow the same rules as the pros and an amateur baseball advisory member sits on the rules committee. According to the Official Rules of Baseball, baseballs must fit into a narrow range of dimensions to be used in official play. At a minimum, a baseball needs to be 9 inches in circumference. This means that the smallest allowable ball ill have a diameter of 2.86 inches and a radius of 1.43 inches. It makes the minimum surface area of a baseball 25.78 square inches and the minimum volume 12.32 cubic inches. At most, a baseball can have a circumference of 9.25 inches. This is a small increase -- less than 3 percent -- over the minimum size, but it affects all the dimensions of the ball. It makes the maximum diameter 2.94 inches and the maximum radius 1.47 inches. The maximum allowable surface area for a baseball is 27.24 square inches and the maximum volume is 13.37 cubic inches. Baseballs also have a set weight range. The minimum weight for a baseball is 5 ounces. On the high end, a baseball can weigh as much as 5.25 ounces. This difference is too small to be noticeable without measuring a ball. The maximum weight represents a 5 percent increase over the minimum size. A ball doesn't meet baseball's specifications -- even if it's dimensions are correct -- unless it is the proper shape and made of the appropriate materials. According to the official rules, a ball must be spherical in shape. As for the materials, it needs to have a core made of cork or another similar material, wrapped in yarn and covered with two strips of leather -- either cowhide or horsehide.